Vitaminwater is the latest company to see a marketing mishap go viral. In this case, the apology is along the lines of: Pardon my French. 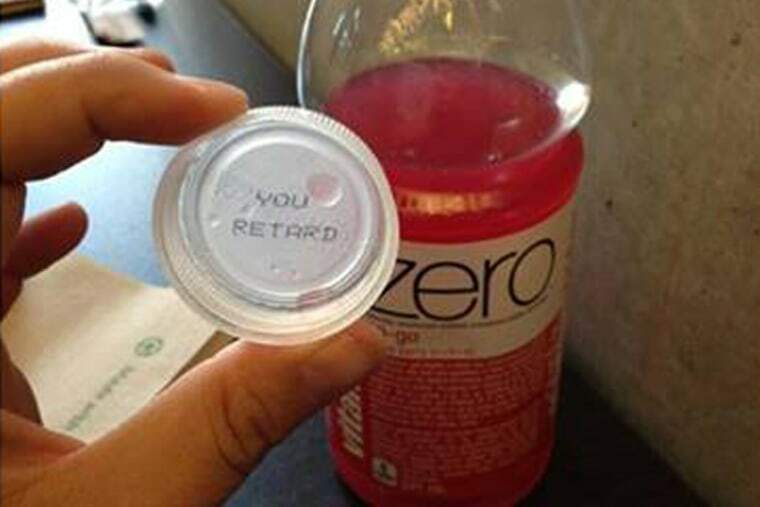 A Canadian shopper opened a vitaminwater to find some unexpected words on the bottlecap: "YOU RETARD." In French, that's along the lines of "You're late." The offending text went viral after the cap was found by Edmonton-based photographer Blake Loates, according to the Metro newspaper. Loates, whose sister has cerebral palsy and autism, sent a picture of the cap to her father, Doug Loates, who in turn wrote a public letter to Coca-Cola, which owns vitaminwater. His post on Facebook stated: "I am astonished that in the 21st century, ANY person or corporation would think this use of the "R" word is 1) funny, 2) acceptable or 3) anything but reprehensible! As the father of an amazing, beautiful, funny, sweet, and brave 11 year old girl with cognitive delays, I find this act by Coca-Cola so disheartening that I cannot merely sit by and "get over it"!" In a statement to CNBC, Coca-Cola explained what went wrong. "We sincerely apologize for inadvertently offending anyone. We take every consumer concern very seriously. This is a genuine oversight in the review process. The mistake has been corrected and the words removed from all future production," said Shannon Denny, director of brand communications for Coca-Cola Refreshments Canada. "The mistake occurred in anticipation of a potential consumer promotion for glacéau vitaminwater in Canada. We started printing random combinations of English and French words under the caps of glacéau vitaminwater. The top word English and the bottom, a different word in French. Regretfully, the French words were not reviewed from an English standpoint. In this case a French word, despite an innocuous meaning in French but an offensive meaning in English, made the production list of words," Denny said in an email. "This word should have been removed due to the English connotations and we have taken immediate action to thoroughly investigate this matter and to stop producing bottles with the offending caps. This was a genuine mistake in the review process and we sincerely apologize." Although the caps are no longer being stamped with the phrases, there may still be offending bottles on shelves, she acknowledged. "At this time, we believe a very small number might contain this word. Given the random nature of the printing process, we do not know whether or not this specific text was used more than once, however we believe the chances are extremely slim." The company took full responsibility for the error. "We did have some agency support to develop this campaign, however it was an oversight on our part that this occurred. We offer our profound apologies to the family and all of our consumers." The company sent a separate apology letter to Doug Loates, which he posted on Facebook. "I am satisfied with their reply and their actions," he wrote. "If we change even a few people's attitude towards the use of this word, then we have won," he said. "And we did win. Many of you confessed to using the word but after seeing Fiona and understanding the negative impact of the word, have promised not to use it again! Change takes a catalyst like this event has been and we have to be patient."